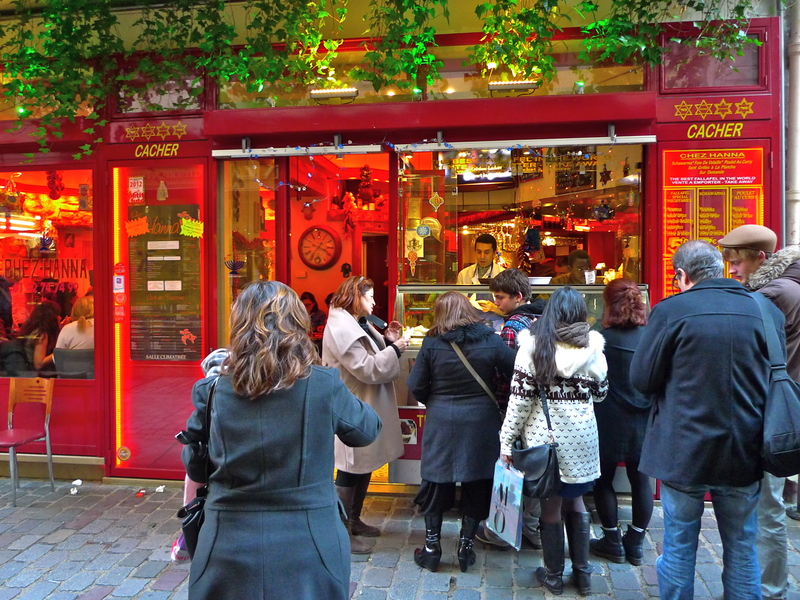 THE RUE DES ROSIERS is a medieval street in the 4th arrondissement of Paris dating from the early thirteenth century. Originally, it was a chemin de ronde, a parapet or rampart walk on part of the wall of Philippe Auguste, the first wall to surround Paris. It takes its name from the rosiers or rose bushes surrounding this part of the wall. 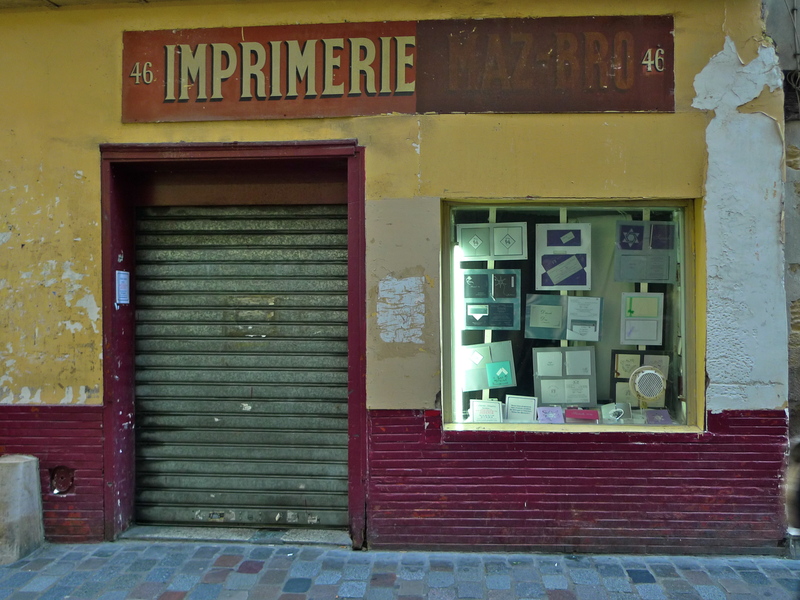 Today, the Rue des Rosiers lies at the centre of the Jewish quarter in Paris known as the “Pletzl” or “little place” in Yiddish. This is not new of course; a Jewish community has lived in this area since the thirteenth century. 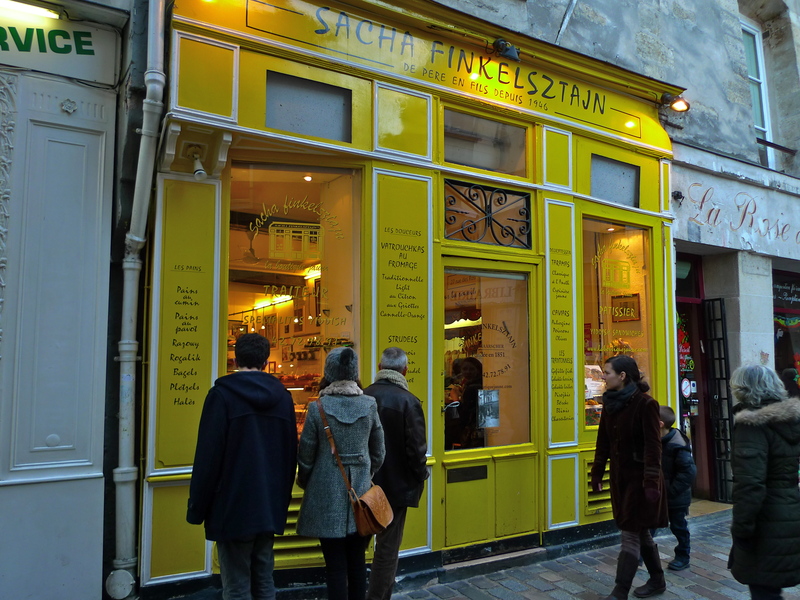 Streets like the Rue des Rosiers evolve and change as times, populations, and tastes change. 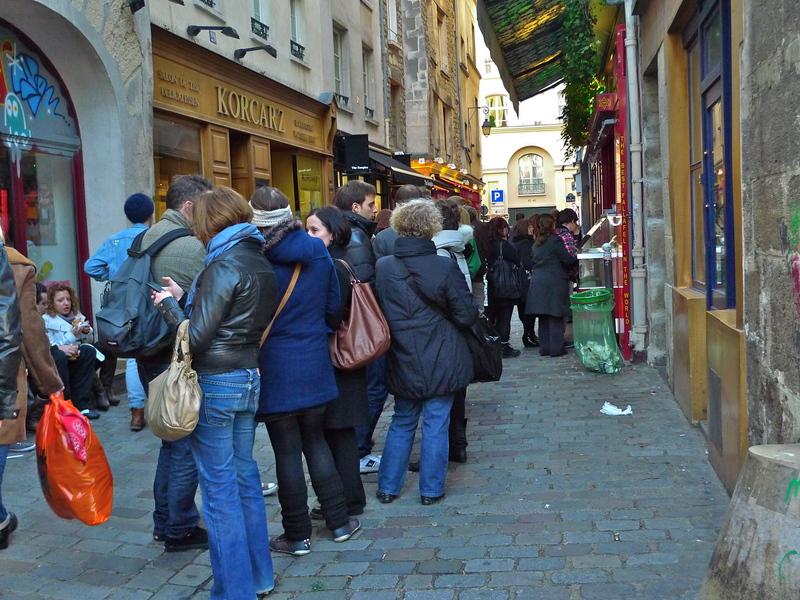 The queues lining up outside the specialist food shops are common currency today. 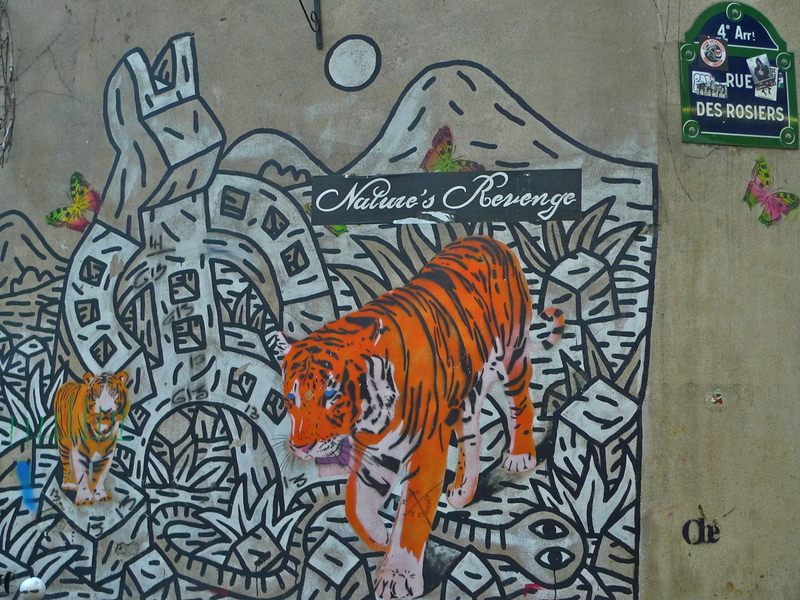 In recent times, a tide of gentrification has swept over this and the surrounding area as the so-called “Bobos” – bourgeois-bohemians who want to live in Paris, but can’t afford property in the more upmarket neighbourhoods moved in. And whilst some of the character remains, some of it has been lost as fashion shops sporting some of the trendiest fashion labels have moved into the area willing to pay the crazy prices for property. This shop, Le Temps des Cerises, (Cherry Time) is now an upmarket clothes shop but it was once famous as the Goldenberg Pletzl restaurant and delicatessen, better known as “Jo Goldenberg’s”, serving up potato latkes, matzo ball soup or corned beef sandwiches to Parisian Jews and tourists alike. In 1982, Jo Goldenberg’s kosher restaurant became even more famous for all the wrong reasons. On 9th August, a grenade was thrown into the restaurant. Pandemonium ensued as two masked gunmen burst in and sprayed the room with machine gun fire killing six people and injuring twenty-two. 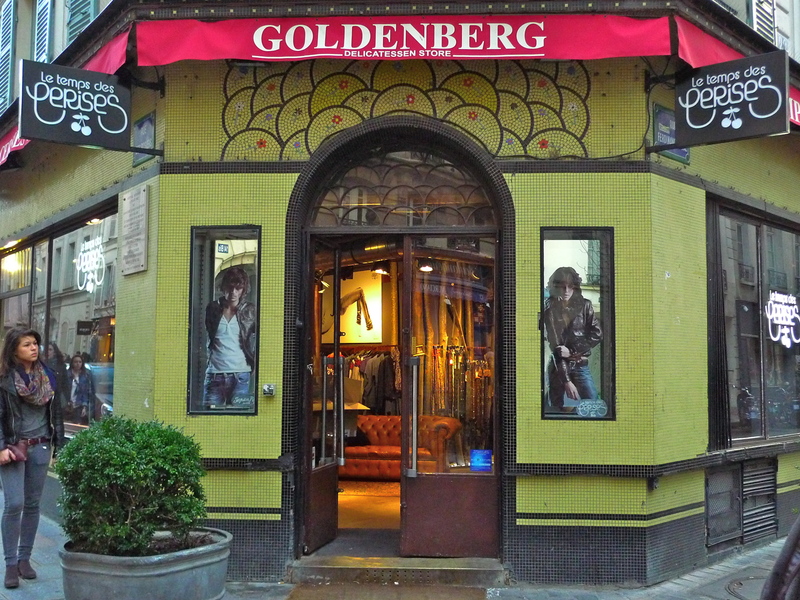 After the 1982 attack, Goldenberg’s re-opened and business returned to normal. In 2006, after a change of management, some internal feuding and a string of poor hygiene reports, Goldenberg’s finally put up the shutters and closed. The gradual gentrification of the area and subsequent skyrocketing property prices put the premises beyond the reach of the local community. In 2008, property developers put it up for rent and, like so many properties in the area, it was snapped up by a large fashion chain. 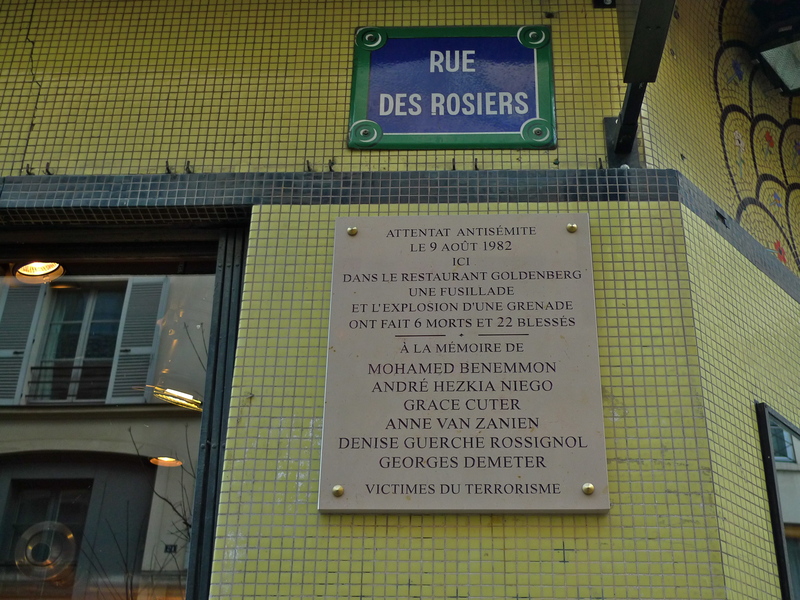 It seems that the Rue des Rosiers and Jo Goldenberg’s were able to survive a terrorist attack … but not a fashion attack.